With all the talk about climate change — ninety-seven percent of climate scientists agree it’s real — did you ever wonder what your life would look like if it was underwater? CarbonStory, a crowdfunding platform for climate change projects, recently teamed up with ad agencies BBDO and Proximity Singapore to explore the scary sea level rise possibility. Together, they created a new digital interactive campaign, World Under Water. Recognize London under all that water? Using Google Maps, users can type in any address around the world and see a simulation of what the place would look like submerged underwater. Users hear the sounds of subtle rippling water while facts about climate change appear and disappear on the screen. 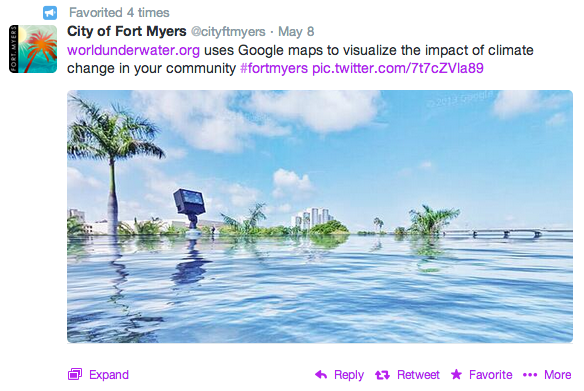 The city of Fort Meyers gave World Under Water a try, posting their personalized image to Twitter. Climate change isn’t something to be overlooked, and these organizations used interactivity in a smart way to make a powerful statement. Our hats go off to World Under Water for its work to promote awareness on a big world issue like Climate Change and personalize its effects for each viewer.